We sell new and refurbished pre-owned bakery and foodservice equipment. Our skill at refurbishing pre-owned equipment includes donut machines, sheeters, bread slicers, and mixers, just to name a few. And, our staff of friendly factory-trained technicians is available to help you solve all your equipment service problems. They work quickly, with precision, to minimize your down time and repair expenses. With a fleet stocked with thousands of dollars in parts, we are prepared to get you up and running as quickly and efficiently as possible. We have a state-of-the-art Test Kitchen designed to accommodate a number of gas or electrical appliances at one time and can be used as a training facility. We are also Foodservice Equipment Contractors and have many years of experience installing and servicing the entire equipment list for bakeries, restaurant kitchens, delis, produce departments, cafeterias, and meat departments. 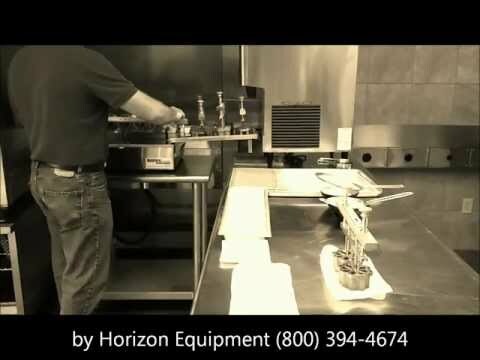 Horizon installs all major manufacturers of bakery and food service equipment.